As a flag company, we fly our American flag every day, 365 days a year. A common question we receive is, “What days should I fly my flag?”. 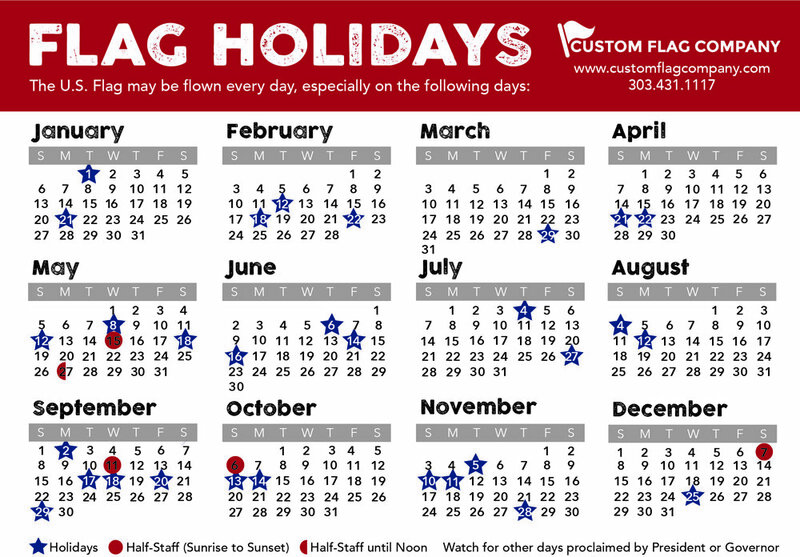 According to the Flag Code, it is appropriate to fly your flag daily, but especially on the days listed below. There are a few days that are automatic half-staff days. Peace Officer Memorial Day, Patriot Day (9/11), National Fallen Firefighters Memorial Day, and Pearl Harbor Day. On Memorial Day, the flag flies at half-staff until noon, then it is proudly raised for the remainder of the day. Here is an updated list of flag flying holidays for 2019. You may also download the calendar for easy reference. Remember to proudly fly your US Flag! Posted on January 22, 2019 by Maddi Griebling.